Register for Your NALA Test Today! Love love love this school it’s more like a family. Great staff all around very efficient and loving. Wouldn’t have chosen a better college to attend. Love you guys and I thank you all for everything!! To meet the demands of the community, Northwest Career College’s NALA Testing Center is open 6 days a week. Monday through Thursday from 8:00 a.m. to 7:00 p.m.,Friday from 8:00 a.m. to 3:00 p.m. and Saturday from 8:00 a.m. to 3:00 p.m.
Click here to take you to the NALA website for Examination Information. Northwest Career College has partnered with NALA business because of their focus on state-of-the-art technology that enables Northwest to reliably deliver exams and provide the highest levels of service to our clients and our students. 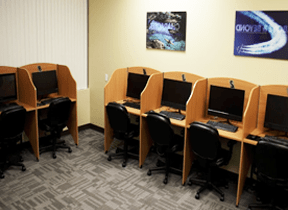 Our testing facility is located on the beautiful Northwest Career College campus at 7365 Prairie Falcon Rd #110 in the Las Vegas Technology Center. For more information about NALA Testing, Click here.